Osmaniye Genclik (KBSL) landed 28-year old Chilean international center Ziomara Morrison (194-89, agency: ProDep Management). It is actually her comeback to Osmaniye as she has played here before. Morrison played most recently at Wisla Can-Pack in Polish TBLK. In two Eurocup games she averaged 14.0ppg, 3.0rpg, 2.0apg and 1.0spg last season. 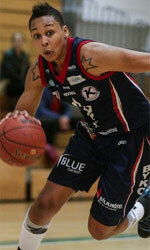 She also played 34 games in TBLK where she had 8.7ppg, 5.1rpg and 1.2apg. Morrison helped them to win the cup and make to league final. The previous (15-16) season she played at Osmaniye. In 29 games she recorded very impressive stats: 17.4ppg, 10.0rpg, 1.2apg and 1.1bpg. It was a very successful season in her career as she was selected to Eurobasket.com All-Turkish TKBL 1st Team. Morrison won Chilean Liga Femenina championship title in 2014. She also represented Chile at the ODESUR Games in Santiago (Chile) three years ago. Morrison's team won Silver and her stats at that event were 5 games: Score-1 (28.6ppg), Reb-1 (19.8rpg), 2.6apg, 1.0spg, Blocks-1 (2.4bpg), FGP: 56.3%, FT: 83.5%. Morrison is a very experienced player. And here thanks to pro basketball she experienced life in five different countries playing on three different continents. She is familiar with European, Latin American and of course North American leagues. Morrison has played previously professionally in Italy (Ribera), Spain (Rivas Promete), WNBA (Indiana Fever and San Antonio Silver Stars), Turkey (Besiktas and Ceyhan Bld) and Chile (Los Leones and Univ. Austral).